Get ready to be a part of most anticipated fund raising Carnival at Karachi Medical and Dental College (KMDC) for their NGO called H.O.P.E.S. (abbreviated for “Help of Patients in Exigency by Student”). H.O.P.E.S. is a non-political welfare organization run by the students of Karachi Medical and Dental College which aims to alleviate human suffering. We provide free of cost medicines and diagnostic services to patients of Abbasi Shaheed Hospital and Karachi Institute of Heart Diseases. This Fun Fiesta is all about giving you the best time and ensuring that you have fun along with helping and being able to stand up as an individual capable of influencing others. We have a lot of entertaining activities and social events in store for you along with food court, games, boutique, jewelries, handicrafts and many other stalls! Location: Go Aish Adventure Park, Safari Park. P.S: If you buy 10 tickets then YOU get ONE FREE! 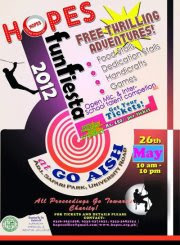 :D Gather all your friends and get your tickets as soon as possible and be a part of the most adventurous mega event! Tickets can be either be bought from KMDC or on the event day!